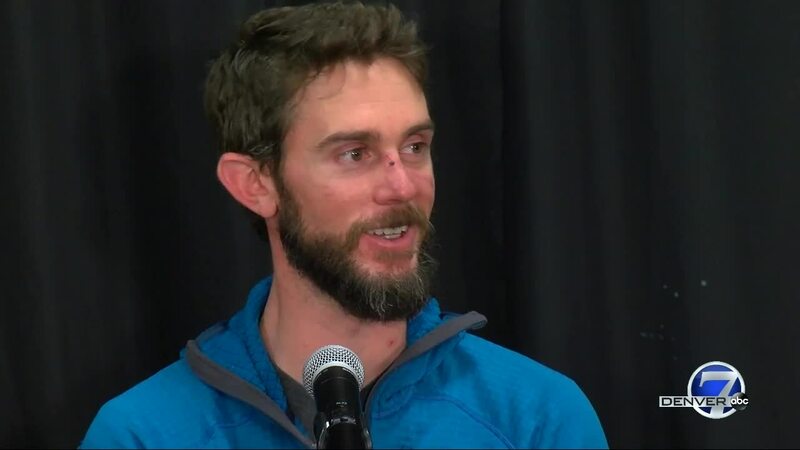 The man who fought off and killed an attacking juvenile mountain lion on Feb. 4 shared his story on Thursday afternoon. Travis Kauffman, 31, who’s from Mountain Home, Arkansas, has lived in Fort Collins for five years and works in environmental consulting. LARIMER COUNTY, Colo. — When Travis Kauffman turned around to see what was making noise behind him on the trail, he felt a wave of emotions, starting with disbelief and then fear. What he saw on the ground, about 10 feet away, was his worst fear: a mountain lion. Kauffman, 31, who’s from Mountain Home, Ark., has been a runner for about one year and lives in Fort Collins. On Feb. 4, like any other day, he went out for a run. He parked at Lory State Park for a 12- to 15-mile scenic loop that included parts of Horsetooth Mountain Open Space. He ended up on West Ridge Trail after ditching his initial plan on another trail due to icy conditions. While he had biked West Ridge Trail before, that day was the first time he'd traveled it by foot. About a quarter-mile down the trail, he heard pine needles rustling behind him. He turned his head and saw what he described as his worst fear: a mountain lion about 10 feet behind him. "I had my heart sink into my stomach a little bit, and threw my hands up and started yelling," he said. But the cat continued to approach and lunged at his face. Kauffman put his arms in front of his face and the animal latched onto his right wrist, clawing his face and legs. He tried to throw it off of him, but they both tumbled off a slope on the south side of the trail. As they wrestled, Kauffman said his fear turned into a fight response, though he was still terrified that another mountain lion, like a mother, was somewhere nearby. After some time, Kauffman was able to get on top of the animal while it was on its stomach and pinned its back legs with his left knee. He scrambled to find a stick to see if he could stab the cat in the throat, he said. But the sticks, which were mostly rotten, did little to deter the animal. He changed tactics and picked up a heavy rock near him and tried to hit the animal in the head. When that also failed, he realized he had to take more drastic measures, he said. He shifted his weight and got his right foot on the animal's neck and stepped down. After a few minutes of struggling, the lion's jaws opened, releasing Kauffman's wrist, and he was able to scramble back up to the trail, he said. As Kauffman started to run back down to the trailhead, he said he felt like he was on a "fear high." He started to notice all the rocky overhangs along the trail — perfect perches for mountain lions, he said. He also spotted what he believed were mountain lion tracks in the snow along the trail. Around the second mile down, he ran into a runner who helped him down the mountain. The men also ran into a man and woman closer to the Soderberg parking lot at the park, and the woman drove him to the hospital around 3 p.m. Meanwhile, the other runner and the woman's husband went to go pick up Kauffman's truck at Lory State Park. Kauffman said his face was a "bloody mess" when they got to the hospital. He had to have 17 stitches to repair a gash on his cheek, six stitches on the ridge of his nose, two on another part of his cheek and three on his wrist, where the lion had clamped down. But he didn't suffer from any broken bones or tendon damage, CPW said. 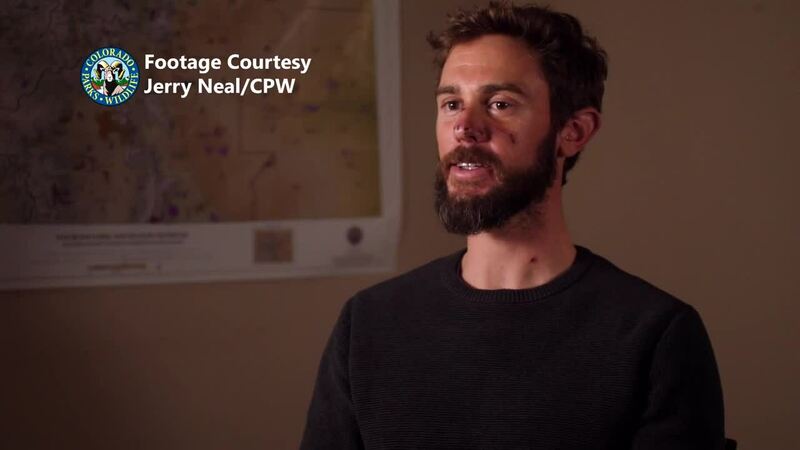 He asked the physician's assistant at the hospital if she had ever treated a mountain lion attack victim before and she said she hadn't, but had seen a person who falsely claimed to have been attacked by a bear in 2018. As he talked with media on Thursday afternoon, Kauffman said his emotions ran wild during the attack: disbelief to shock to fear and, ultimately, to an instinct to fight. He said he will return to the trails — even that same one — for future runs. He said he'd recommend that other runners stay vigilant and avoid wearing headphones on trails, especially when they go out alone. He's experienced a small bit of fame in the wake of the attack, but doesn't think he'll live up to the reputation some have created for him, he said. A few outdoor groups have even given him nicknames, like King of the North. Horsetooth Mountain Open Space closed on the day of the attack and didn’t reopen until Feb. 13 after authorities found other mountain lion activity around the park. On the day of the attack, wildlife officers returned to the area where Kauffman had said the attack happened and found several items he said he’d left behind. They also found the mountain lion’s body. After a necropsy, CPW said the lion was less than a year old and had died of suffocation, which matched what Kauffman told authorities. It tested negative for rabies and had blunt force trauma to the skull, CPW said. Over the days and following weekend while the park was closed, rangers in Larimer County and state wildlife officers assessed mountain lion activity in the area. They located and captured two other juvenile mountain lions , which are believed to be siblings of the one that attacked Kauffman, in traps on Feb. 9 and 10. The animals were taken to a rehabilitation center and will be released into the wild at a later date. After their capture, authorities did not find evidence of other lions in the area. Steve Gibson, district manager for Larimer County Department of Natural Resources, said that doesn't mean the park is void of mountain lions. Mountain lion attacks on people are rare — fewer than 20 people have died from an attack in North America in more than 100 years, CPW said. Since 1990, 16 people have been injured and three people died in Colorado as a result of mountain lion attacks. Larimer County said its staff is planning educational opportunities for visitors about recreating in mountain lion habitat.